It has been SO incredibly warm in IL for our visit, except today, the day we head back to Portland. This is fine by me, we have enjoyed the warm 80+ degree weather tremendously. On one of the nights we got together with my Dad, brothers, and my brother’s girlfriend – we enjoyed a cookout. My Dad grilled steak and tilapia (I had some of this), and buttered mushrooms. He also gave me 5 whole pounds of red potatoes to do with as I wished. So, I went to work 3 hours before our dinner time and finished with about 40 minutes to spare. Waiting for the water to boil and chopping/cooking the potatoes took the longest. This is not vegan but may be considered vegetarian. It could definitely be veganized with a vegan cashew mayo or chive dip but I was making SO much that I just wanted to go the easy route, not having access to equipment or supplies. A cashew ranch base would be perfect if you made a much smaller version of this. There were 6 of us for dinner, but this could probably feed an army. My brother filled almost half his plate with potato salad after trying a few bites and then took home a huge tupperware of leftovers – same with my Dad. Just so you have an idea of how much this makes. The measurements might not be exact as I’m writing this almost a week after it was made but I believe recipes should almost always be adapted to your tastes with more/less of some things. While those are cooking combine your other ingredients in a very LARGE bowl - except ranch dressing, mustard, and eggs (I saved the eggs until the end because I didn't want them to lose too much shape in the mixing). Once the potatoes are done, drain them and drizzle with a little extra virgin olive oil to keep them from sticking. Allow them to cool for maybe a half hour - I put mine in the freezer. Then add them to your very large bowl of prepped ingredients mixing in the ranch dressing, mustard and finally the eggs. Mix until incorporated and taste or adjust seasonings as needed. 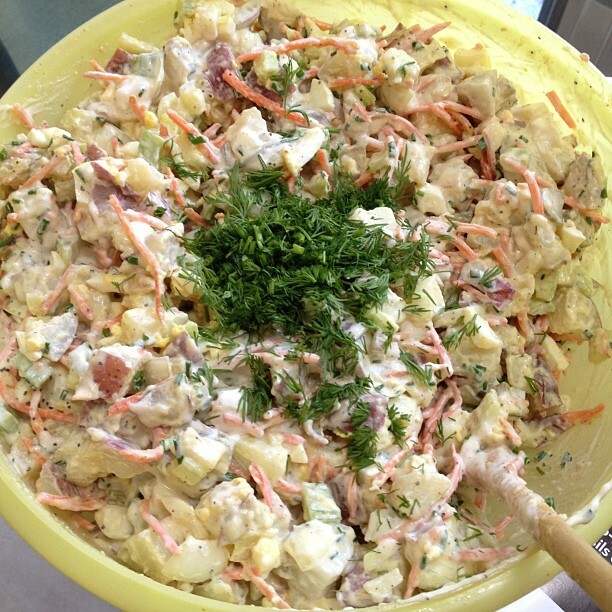 I first had a ‘ranch’ potato salad a few years ago, when our neighbor/landlord/friend brought me a small sample of his to try. It was love. I’m much more partial to ranch than mayo even though they are probably not that different – ha. Fresh dill is a must and I added celery, carrots, pickles, and basil to this. Major love, it was so very good. Are you in cookout weather yet? or eat outside weather?